The AIA creates an agency procedure called "inter partes review" or IPR that allows a third party to ask the PTO to reexamine the claims in an already-issued patent and to cancel any claim that the agency finds to be unpatentable in light of prior art. The Act, as relevant here, provides that the PTO’s decision "whether to institute an inter partes review. . . . shall be final and non-appealable," 35 U.S.C. §314(d), and grants the Patent Office authority to issue "regulations . . . establishing and governing inter partes review," §316(a)(4). PTO regulation 37 CFR §42.100(b) provides that, during IPR, a patent claim "shall be given its broadest reasonable construction in light of the specification of the patent in which it appears." In 2012, Garmin sought IPR of all 20 claims of a patent held by Cuozzo, asserting that claim 17 was obvious in light of three prior patents. The PTO agreed to review claim 17. It also decided to reexamine claims 10 and 14 on that same ground because it determined those claims to be logically linked to the obviousness challenge to claim 17. The Patent Trial and Appeal Board concluded that the claims were obvious in light of prior art, denied for reasons of futility Cuozzo's motion to amend the claims, and canceled all three claims. Cuozzo appealed to the Federal Circuit, claiming that the PTO improperly instituted IPR with respect to claims 10 and 14, and alleged that the Board improperly used the "broadest reasonable construction" standard to interpret the claims rather than the standard used by courts, which gives claims their ordinary meaning as understood by a person of skill in the art under Phillips v. AWH Corp., 415 F. 3d 1303. The Circuit rejected both arguments, reasoning that §314(d) made the PTO’s decision to institute IPR "nonappealable," and it concluded that the regulation was a reasonable exercise of the agency's rulemaking authority. 1. Section 314(d) bars Cuozzo's challenge to the Patent Office's decision to institute inter partes review. (a) The text of §314(d) expressly states that the Patent Office's determinations whether to institute inter partes review "shall be final and nonappealable." Moreover, construing §314(d) to permit judicial review of the PTO’s decision to institute IPR undercuts the important congressional objective of giving the agency significant power to revisit and revise earlier patent grants. Past practice in respect to related proceedings, including the predecessor to IPR, also supports the conclusion that Congress did not intend for courts to review these initial determinations. Finally, reading §314(d) as limited to interlocutory appeals would render the provision largely superfluous in light of the APA. (b) The "strong presumption" favoring judicial review is overcome here by these "‘clear and convincing’" indications that Congress intended to bar review. Given that presumption, however, the interpretation adopted here applies to cases in which the challenge is to the PTO’s determination "to initiate an inter partes review under this section," or where the challenge consists of questions closely tied to the application and interpretation of statutes related to that determination. Cuozzo's claim does not implicate a constitutional question, nor does it present other questions of interpretation that reach well beyond "this section" in terms of scope and impact. Rather, Cuozzo's allegation that Garmin's petition did not plead "with particularity" the challenge to claims 10 and 14 as required by §312 is little more than a challenge to the PTO’s conclusion under §314(a) that the "information presented in the petition" warranted review. 2. The PTO regulation requiring the Board to apply the broadest reasonable construction standard to interpret patent claims is a reasonable exercise of the rulemaking authority granted to the PTO by statute. (a) Where a statute leaves a gap or is ambiguous, this Court typically interprets a congressional grant of rulemaking authority as giving the agency leeway to enact rules that are reasonable in light of the text, nature, and purpose of the statute. Here, the statute grants the PTO the authority to issue regulations governing IPR, and no statutory provision unambiguously mandates a particular construction standard. The nature and purpose of IPR does not unambiguously require the PTO to apply one particular claim construction standard. Cuozzo's contention that the purpose of IPR—to establish trial-like procedures for reviewing previously issued patents—supports the application of the ordinary meaning standard ignores the fact that in other significant respects, inter partes review is less like a judicial proceeding and more like a specialized agency proceeding. This indicates that Congress designed a hybrid proceeding. The purpose of IPR is not only to resolve patent-related disputes among parties, but also to protect the public's paramount interest in seeing that patent monopolies are kept within their legitimate scope. Neither the statute's language, nor its purpose, nor its legislative history suggests that Congress decided what standard should apply in inter partes review. (b) The regulation is a reasonable exercise of the Patent Office's rulemaking authority. The broadest reasonable construction standard helps ensure precision in drafting claims and prevents a patent from tying up too much knowledge, which, in turn, helps members of the public draw useful information from the disclosed invention and understand the lawful limits of the claim. The PTO has used this standard for more than 100 years and has applied it in proceedings which, as here, resemble district court litigation. Cuozzo's two arguments in response are unavailing. Applying the broadest reasonable construction standard in IPR is not, as Cuozzo suggests, unfair to a patent holder, who may move to amend at least once in the review process, and who has had several opportunities to amend in the original application process. And though the application of one standard in IPR and another in district court proceedings may produce inconsistent outcomes, that structure is inherent to Congress' regulatory design, and it is also consistent with past practice, as the patent system has long provided different tracks for the review and adjudication of patent claims. The PTO’s regulation is reasonable, and this Court does not decide whether a better alternative exists as a matter of policy. Allied Erecting v. Genesis – The panel affirms the IPR invalidation of claims directed to a universal attachment for mounting a variety of construction and demolition tools that can easily and quickly convert between different tools. Allied argued that two prior art pieces of equipment disclosed in patents to Caterpillar and Ogawa could not be physically combined in the manner proposed by the Board. However, the panel rules that the test is not whether the features of a secondary reference may be bodily incorporated into the structure of the primary reference, but rather whether a skilled artisan would have been motivated to combine the teachings to achieve the claimed invention. Allied also argued that Caterpillar teaches away from Ogawa because in Ogawa the main pivot pin functions as both the pivot point for the jaws and the means for attaching the jaws to the frame. According to Allied, because Ogawa encourages one in the art to do exactly what Caterpillar says they should not do—have the main pivot pin for both jaws also mount the jaws to the frame—Caterpillar teaches away from the combination with Ogawa. However, the panel rules that the disadvantage underscored by Caterpillar does not militate against finding the combination proper. 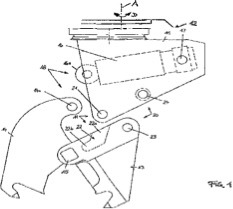 Caterpillar expresses doubt as to whether an optimal design feature may have the main pivot pin for both jaws also mount the jaws to the frame in order to effect the quick change functionality. There is no teaching away from the combination of Caterpillar and Ogawa because the combination does not utilize the pivot pin attachment mechanism of Ogawa. There is no teaching away in Caterpillar from using the Ogawa feature of two movable jaws. In any event, the PTAB grounded its modification of Caterpillar on Ogawa's teaching of two movable blades and wide range of angular movement. Thus, Ogawa's disclosure of the need for two separate cylinders is extraneous to the PTAB's decision. According to the PTAB, the claims of the '489 patent would have been obvious whether only a single or two cylinders are used. Genzyme v. Biomarin – The Circuit affirms IPR obviousness rulings holding that two of Genzyme’s patents were invalid as obvious. Genzyme argued that the PTAB erred in its construction of whereby clauses in the patents at issue by construing these clauses to encompass a reduction of accumulated glycogen anywhere in a patient, rather than construing these clauses to require that the reduction of glycogen occur in the patient's skeletal muscles. The panel rules that the Board’s construction was correct because the claims were not restricted during prosecution. Genzyme also argued that the Board violated the Administrative Procedure Act (“APA”) by relying on cited references in its final written decisions that were not specifically used to institute the IPR. However, because Genzyme had notice of the references, the panel holds that the PTAB did not err in relying on these references. Comment: OnJune 10 the Circuit reversed and remanded a Board decision in SAS v. ComplementSoft because the Board adopted a new claim construction in its final written decision without giving the parties an opportunity to address that new construction. In that case, the panel held that this was a violation of the APA. However, in Genzyme the panel determined that Genzyme was already aware of the prior art and could have addressed it in its earlier filings. Allied appeals an IPR decision that claims 1-21 of its '489 patent would have been obvious over patents owned by Caterpillar and Ogawa. The '489 patent is directed to heavy machinery tools used for construction and demolition that can be attached to a universal body, which in turn can be attached to multiple tools, such as a heavy-duty metal cutting shear, a plate shear, a concrete crusher, or a grapple. One purpose of the patent is to provide a tool attachment system which is easily converted between a plurality of distinct tools. To achieve this objective, the '489 patent describes a quick change feature that enables different demolition tools to be efficiently substituted for one another. Figure 1 of the patent is illustrative of the claimed invention. It depicts a shear (10) attached to a body (18), which is then attached to a piece of equipment, such as a backhoe. Body (18) is referred to as a universal body because it remains common to a series of tools in the attachment system. Figure 57 illustrates the structure of the bridge housing. Sides (19) terminate at receiving member (42) that fits between two bridge housing plates (405, 406). Receiving member (42) has a curved surface (412) formed via a cutaway that engages with cylindrical sleeve (408), and surrounds main pin (16). When receiving member (42) is engaged with sleeve (408), apertures (52) will be aligned and keeper pins (50) can be inserted to attach the bridge housing to the universal body. Caterpillar teaches a system where the jaws can be replaced in a simple manner. Caterpillar discloses a demolition tool with a housing that can be attached to a piece of construction equipment such as an excavator, and has two jaws that work together that can be pivoted relative to each other. Specifically, the first jaw is detachably connected to the housing by means of a first and second mounting device. The first jaw is attached to the housing by two pins and does not move with respect to the housing during operation. The second jaw is connected on one hand by means of the swivel bearing to the first jaw and on the other hand is held by the drive device, which is preferably a hydraulic cylinder which is mounted on the housing. Caterpillar's design thereby enables the quick-change functionality of the jaw sets. Ogawa discloses a bucket attachment for excavation and clasping. Figure 4a depicts a side view of the bucket attachment, including bucket proper (1) and sub-bucket (2). Both buckets are pivotally connected to the distal end of arm (11) via a main pin (5') such that a hydraulic cylinder can cause both buckets to rotate. Through a linkage system, a single hydraulic cylinder is able to rotate and operate both buckets. Genesis filed a petition for IPR, asserting the '489 patent was unpatentable because it was anticipated and obvious over different prior art references. During reexamination, Allied amended claims 1, 7, and 17-19, and added new claims 20 and 21. The amendments and new claims recited that the bridge housing "encased" the main pivot pin, and both blades were "movable" relative to the bridge housing. A PTO examiner allowed the amended and new claims. Genesis appealed the examiner's decision to the Board, which concluded that claims 1-3, 13, 14, and 17-20 would have been obvious over Caterpillar in view of Ogawa. The PTAB then remanded to the examiner to determine whether claims 4-12, 15-16, and 21 of the '489 patent would have also been obvious over Caterpillar, Ogawa and Clark. Allied submitted a second round of amendments to claims 1, 7, and 17-19. The examiner found the amendments did not overcome the PTAB's ground of rejection based on Caterpillar and Ogawa, and that claims 4-12, 15-16, and 21 were unpatentable over Caterpillar in view of Ogawa and Clark. The PTAB affirmed the rejections. The PTAB also found that Ogawa provides two movable blades to enable a wide range of angular movement. Accordingly, the PTAB concluded that based on these disclosures, a person of ordinary skill could have modified Caterpillar to provide for a wide range of angular movement. According to Allied, making the second jaw in Caterpillar movable involves a massive, nonobvious reconstruction of the device that not only changes its principle of operation, but renders the device inoperable as a result. Although the PTAB acknowledged that its suggested modification to Caterpillar would entail design and structural changes, it nonetheless determined that it would have been obvious to apply the teaching of Ogawa to modify Caterpillar so that the first jaw 13 also pivots about the swivel bearing 15 like second jaw 14, while also maintaining the simplified mounting and disassembly so that the jaws can be disassembled in a simple manner. It is not necessary that references be physically combinable to render obvious the patent. The test is not whether the features of a secondary reference may be bodily incorporated into the structure of the primary reference, but rather whether a skilled artisan would have been motivated to combine the teachings to achieve the claimed invention. Upon determining that side walls 13a of Caterpillar serve a similar quick release function as the bridge housing of the '489 patent, it would have been obvious to modify the immobilized jaw of Caterpillar (first jaw 13) in order to provide for a wider range of motion as taught by Ogawa, to make the jaw set more efficient. Although modification of the movable blades may impede the quick change functionality of Caterpillar, a given course of action often has simultaneous advantages and disadvantages, and this does not necessarily obviate motivation to combine. A skilled artisan could modify Caterpillar in view of Ogawa by treating the first jaw like the second. That is, by pivoting the first jaw around the swivel bearing. Such a design allows for a greater degree of movement between the jaws, without impacting the quick change functionality provided by the holding fixtures via side walls 13a. Allied also argues that Caterpillar teaches away from Ogawa because in Ogawa "the main pivot pin functions as both the pivot point for the jaws and the means for attaching the jaws to the frame." According to Allied, because the teachings of Ogawa would encourage one in the art to do exactly what Caterpillar says they should not do—have the main pivot pin for both jaws also mount the jaws to the frame—Caterpillar teaches away from the combination with Ogawa . Caterpillar does not expressly teach away from Ogawa. Contrary to Allied's contention that the PTAB incorrectly relied on Ogawa because its precise structure (i.e., two separate hydraulic cylinders) is criticized by Caterpillar, the disadvantage underscored by Caterpillar does not militate against finding the combination proper. Caterpillar expresses doubt as to whether an optimal design feature may have the main pivot pin for both jaws also mount the jaws to the frame in order to effect the quick change functionality. There is no teaching away from the combination of Caterpillar and Ogawa because the combination does not utilize the pivot pin attachment mechanism of Ogawa. There is no teaching away in Caterpillar from using the Ogawa feature of two movable jaws. In any event, the PTAB grounded its modification of Caterpillar on Ogawa's teaching of two movable blades and "wide range of angular movement." Thus, Ogawa's disclosure of the need for two separate cylinders is extraneous to the PTAB's decision. According to the PTAB, the claims of the '489 patent would have been obvious whether only a single or two cylinders are used. The patents at issue (the ’410 and ’226 patents) are directed to treating Pompe's disease with injections of human acid α-glucosidase. Pompe's disease is a genetic condition associated with a deficiency or absence of the lysosomal enzyme acid α-glucosidase ("GAA"). In a healthy individual, GAA breaks down glycogen, a larger molecule, into glucose. A person with Pompe's disease has significantly reduced levels of GAA, or no GAA at all, and so is unable to break down glycogen into glucose. That inability results in glycogen accumulating in the muscles of affected patients in excessive amounts. Biomarin petitioned for IPR as to the two patents, and Genzyme appealed the rulings which held that the only claim of the '410 patent and claims 1 and 3-6 of the '226 patent were obvious based on various combinations of prior art references. Genzyme first argued on appeal that the Board violated the opportunity-to-respond requirements found in the APA since the Board cited references in its final written decisions that were not specifically included in the combinations of prior art on which the Board instituted the review. In particular, Genzyme objected to the Board's citation of two references dealing with in vivo testing because the Board did not institute review based on any references that included in vivo data from studies on live animals. Thus, according to Genzyme, Biomarin should not have been permitted to use any prior art showing successful in vivo tests to demonstrate obviousness. The Court was not persuaded by this argument because Genzyme had notice of the two references and cited the references in an IPR pleading. The Circuit noted that Genzyme should have filed a motion to exclude the references if Genzyme wanted the Board to disregard those references. Genzyme also argued that the Board erred in its construction of whereby clauses in the '226 and '410 patents. The whereby clause of claim 1 of the '410 patent states, “whereby the concentration of accumulated glycogen in the patient is reduced and/ or further accumulation of glycogen is arrested.” Claim 1 contains the same whereby clause. The Board construed the whereby clause under the broadest reasonable interpretation standard to encompass a reduction of accumulated glycogen anywhere in the patient, rather than necessarily in the skeletal muscles. Genzyme argued that the whereby clause should have been construed to require that the reduction of glycogen occur in the patient's skeletal muscles, rather than occurring anywhere in the patient's body, including the heart, liver, or skeletal muscles. The Circuit affirms the Board’s claim construction, stating that, even though it was understood at the time of the invention that the claimed therapeutic effect would typically result in a reduction in the glycogen level in either the heart or the skeletal muscles, the evidence before the Board suggested that Genzyme chose not to restrict the whereby clause in the patient's skeletal muscles. Instead, Genzyme elected to describe the effects of the therapy in a more general manner by claiming any effective GAA therapy. Finally, Genzyme argued that substantial evidence did not support the Board's finding of a likelihood of success from the combination of the prior art references. Genzyme asserted that the testimony of Biomarin's expert did not provide evidence as to the knowledge of a person of ordinary skill in the art at the time of the invention because the expert used the word "I" in several instances in his declaration rather than referring to "a person of ordinary skill in the art." Genzyme argued that the use of the word "I" showed that the expert was testifying to his own subjective view of the prior art rather than providing evidence of how a person of ordinary skill at the relevant date would have viewed the art. The Circuit rejects this argument because the expert did refer to various facts that were "well-known," "known at the time," "clear," "well-appreciated," "would have been recognized," "would have been readily known," and “would have been further appreciated." Despite these findings, the Circuit also holds that the expert’s testimony was sufficient to support the Board's conclusion that a person of ordinary skill would have had a reasonable expectation of success even though some of the expert’s statements about the prior art were prefaced with the word "I" rather than with repeated incantations of the "person of ordinary skill in the art" formulation.